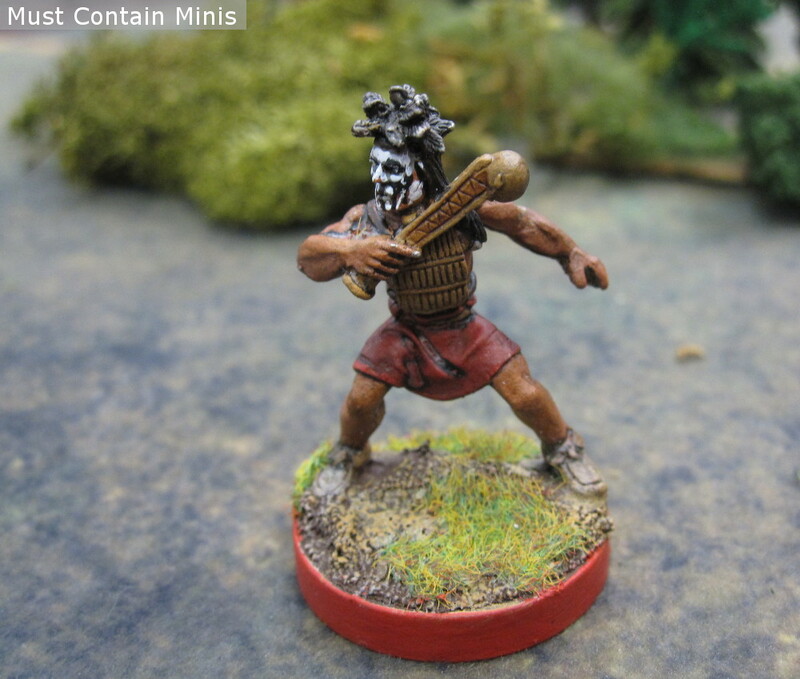 In this post, I introduce readers to some great historical miniatures by a North American Company. 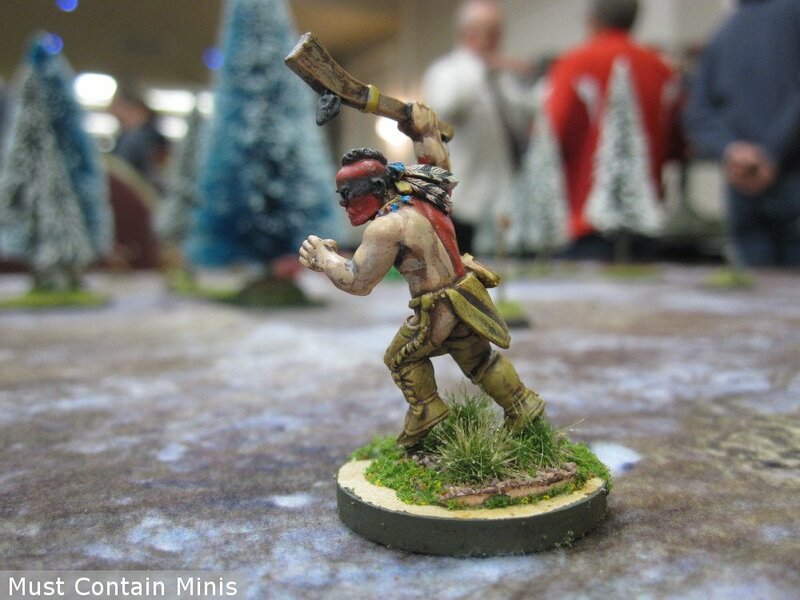 Today we are looking at miniatures from the game Flint and Feather by Crucible Crush. 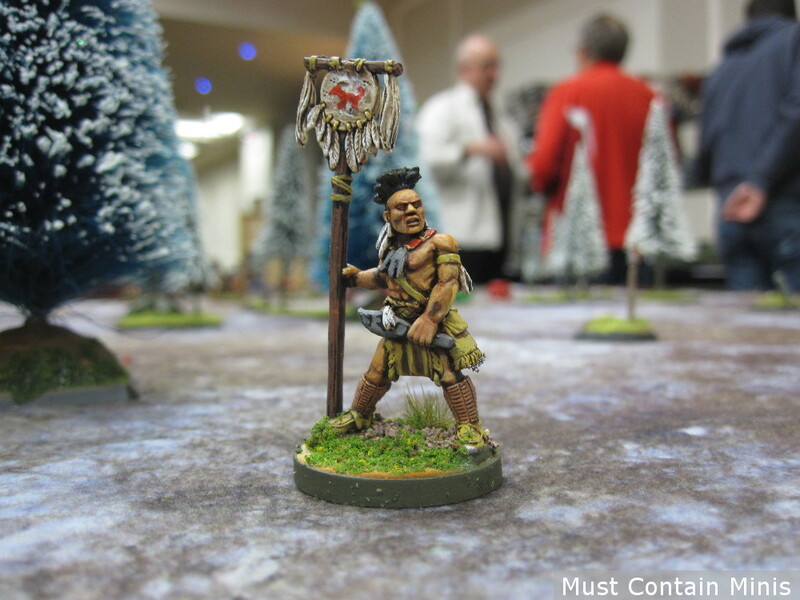 Flint and Feather focuses in on the skirmishes of the Great Lakes First Nations before contact with Europeans. 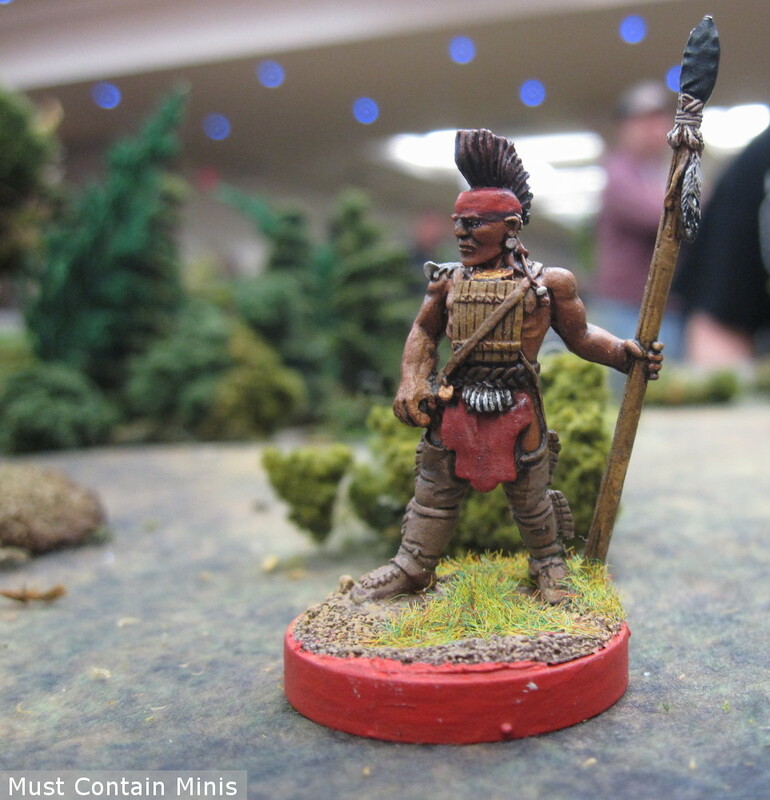 The primary forces in this games are the Warriors of the Huron (or Wendat Confederation) and the warriors of the Iroquois (also known as the Haudenosaunee Five Nations). The game itself is fairly neat. Those familiar with Mad Dogs with Guns will recognize the core system of the game, but there has been updates. While I have the beta rules, and am looking forward to the full rule book, this post is to introduce people to the minis of the game. The rule book itself is still in development, but the miniatures are already available through Crucible Crush. My main goal with this article is to encourage people to check out Crucible Crush and to give people a heads up about an interesting game due to be released soon. There is also a surprise announcement at the end of this article for those that prefer Weird War or Sci-Fi type of games. 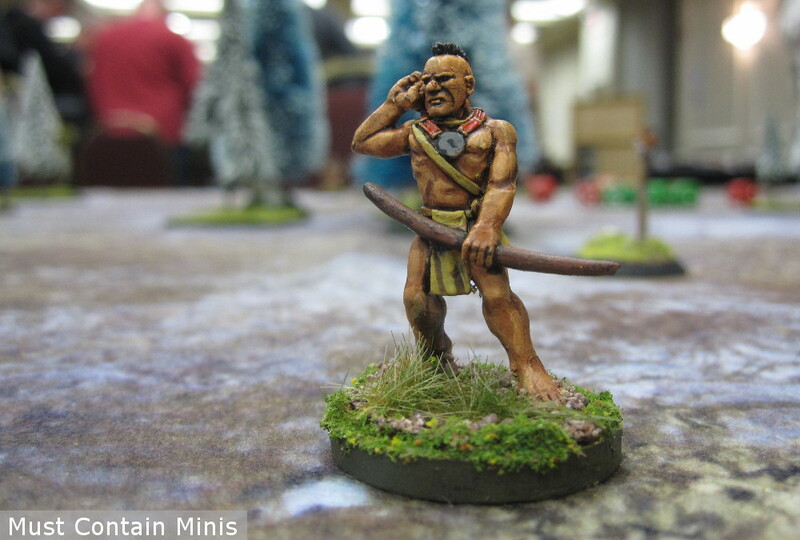 Below are miniatures of Wendat (Huron) and Haudenosaunee (Iroquois) Warriors. I took these pictures during a demo game with Crucible Crush at Hotlead 2018. Although these are not my miniatures, I do have a collection of them that I have not yet painted. 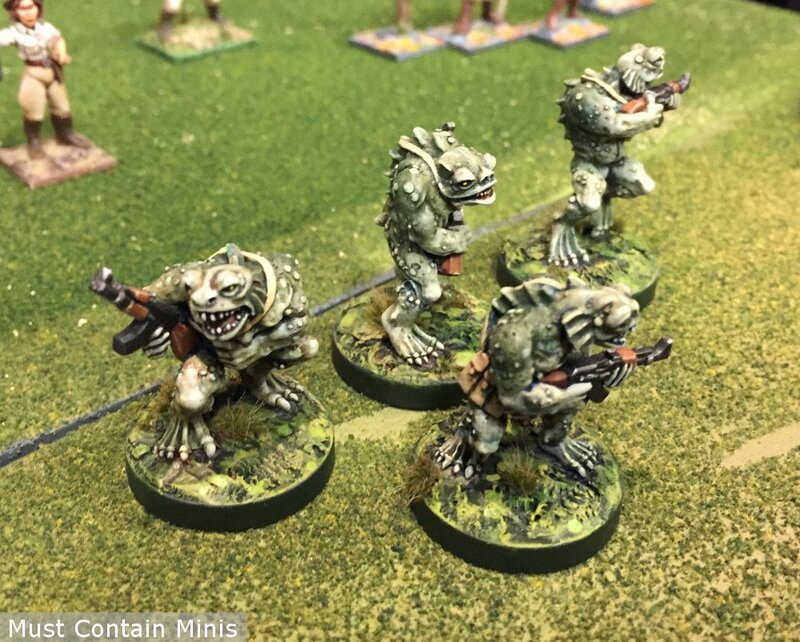 Now let’s take a closer look at some of the minis. 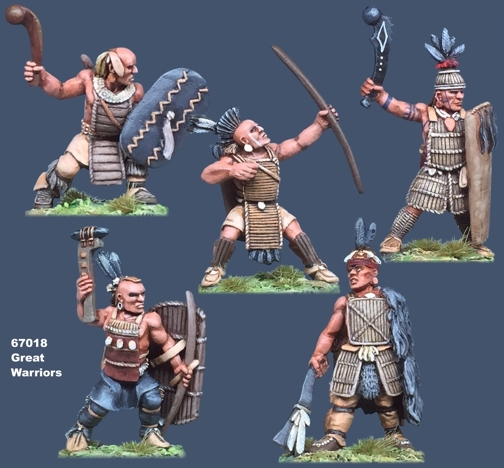 This is just a small sampling, but personally, I think these are some excellent miniatures. They have all been sculpted by Bob Murch (a sculptor from whom I have bought a lot of miniatures). 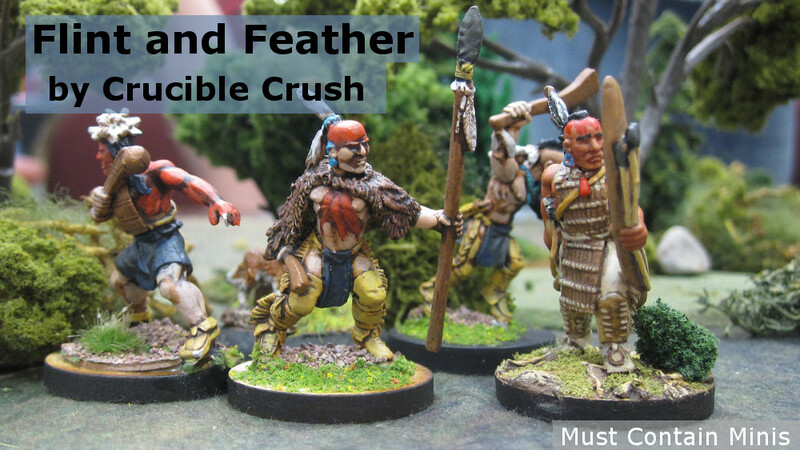 If you check out the Flint and Feather section of Crucible Crush’s webstore, you will find many more awesome looking minis. 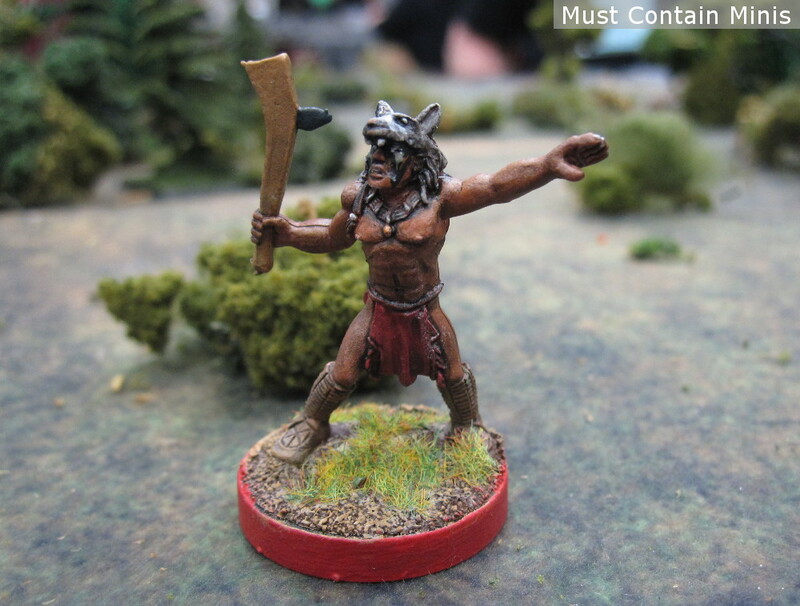 Of all the Miniature Blister Packs currently available for Flint and Feather, below is a picture of my favorite. These are Iroquois (Haudenosaunee) Warriors in wooden armor. I think the style of the armor is pretty cool and interesting to look at. Iroquoian Great Warriors in Wooden Armour. Image from Crucible Crush’s Webstore. Of course, the armor would be of no use against the fire-arms brought over by Europeans, but this is a game set before contact. Another item that I have had my eyes on for a long while is the Flint and Feather Starter Set. Now, this starter set has the Beta rules in it. The full blown book is not out yet, but check out the contents!!! A Cigar Box Battle Mat (3′ by 3′), 20 metal miniatures, tokens, dice and a Beta Rule Book – all at a very reasonable price. 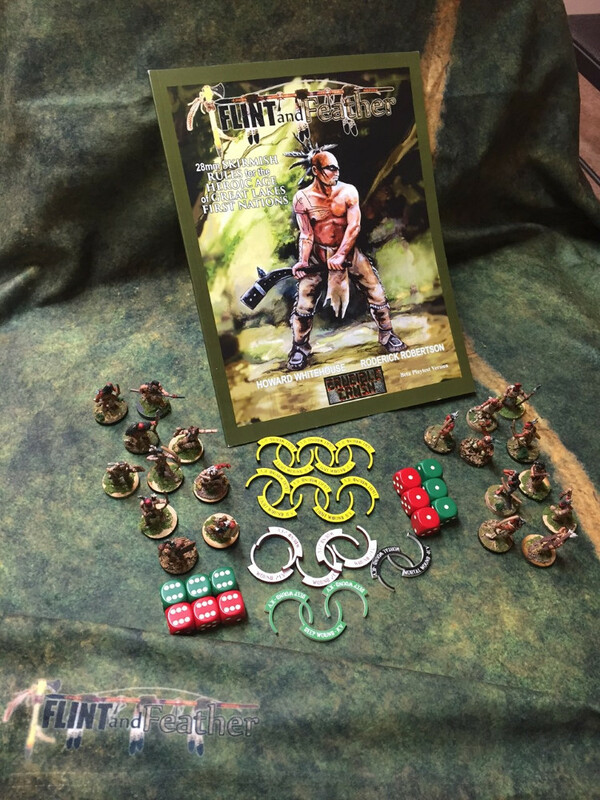 The Flint and Feather Starter Set with Beta rules. Check out those contents!!! Some dice, 20 metal miniatures, some cool tokens that fit around the bases, a beta version rule book and a 3′ by 3′ Cigar Box Battle Mat! This has been on my wish list for a while. Image from Crucible Crush’s Webstore. A look at the tokens in use during the demo game I played. Cool! The rule book is not yet out, but it sounds like the guys at Crucible Crush are expecting it by August 1st. Hopefully this means that they will even have copies for sale at GenCon (where they will be sharing a booth with Pulp Figures and Crocodile Games). 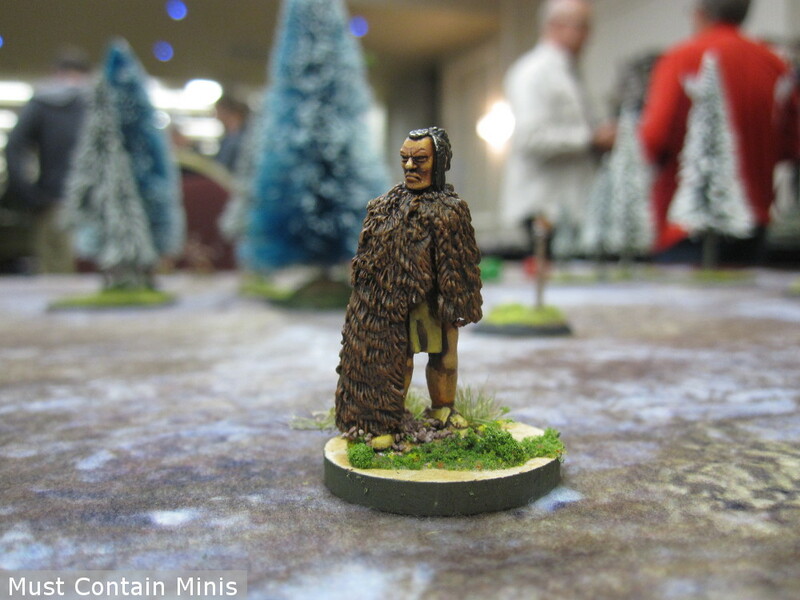 You may also see some of the vendors carrying their products at Historical Miniatures Gaming Society’s Fall Convention (Fall In!). The book itself is 160 pages long. I haven’t seen it yet, but I am really looking forward to taking a peek. Later, they plan to release an expansion to the game that takes place after contact with Europeans (giving rules and stats for English, French and Dutch colonists). If you are interested in seeing these miniatures (or this game) at your local retailer, be sure to talk to them. Crucible Crush is now looking for retail support and would love to have your local stores selling their products. Just tell your favorite store to be in touch with Crucible Crush to see if they can work something out. In addition to the Flint and Feather line, they can also offer Pulp Figures, Cthulhu 28’s and RAFM Miniatures Cthulhu lines to those interested. If you enjoyed this post, below are some links that might interest you. To end, I want to totally switch gears to something completely different, yet related. If you are more into Sci-Fi than Historical or Fantasy Games, this might appeal to you. The guys at Crucible Crush let me know that they are working on something new that would be best described as a Weird War Vietnam skirmish game called Black Sun. The rules would share the same platform as Flint and Feather to make it easier to transition from one game to the other. Some of the miniatures for the game are already released. Below are some pictures of them that I took at a convention earlier this year. 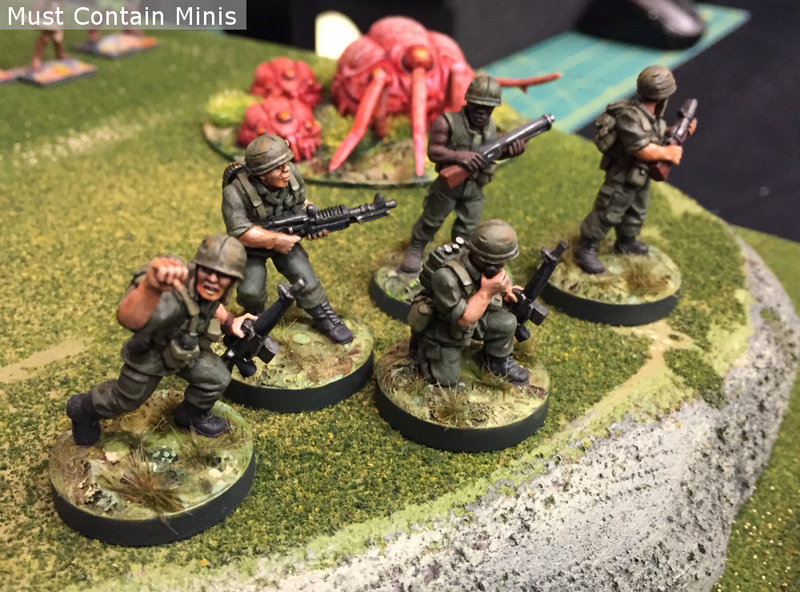 Here we have some Vietnam War Soldiers (for historical fans) and some Cthulhu inspired Deep Ones (for those that like something a little different). I am certainly interested in seeing how this game develops! American Soldiers fighting strange creatures in Vietnam for the upcoming game Dark Sun. Looks like there is something creeping up behind them!!! Hopefully you enjoyed this quick article. I am pretty excited about what is coming from Crucible Crush and am keeping an eye on this very cool company. 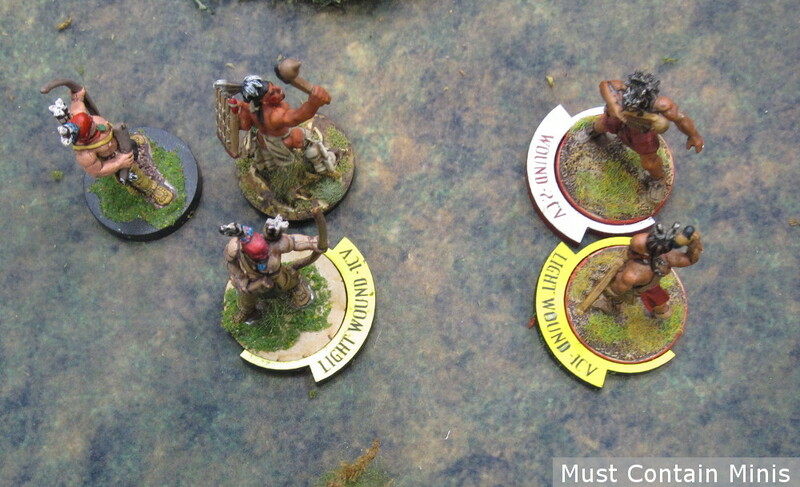 Over on Must Contain Minis, we have a post up today about the game play of Flint and Feather. 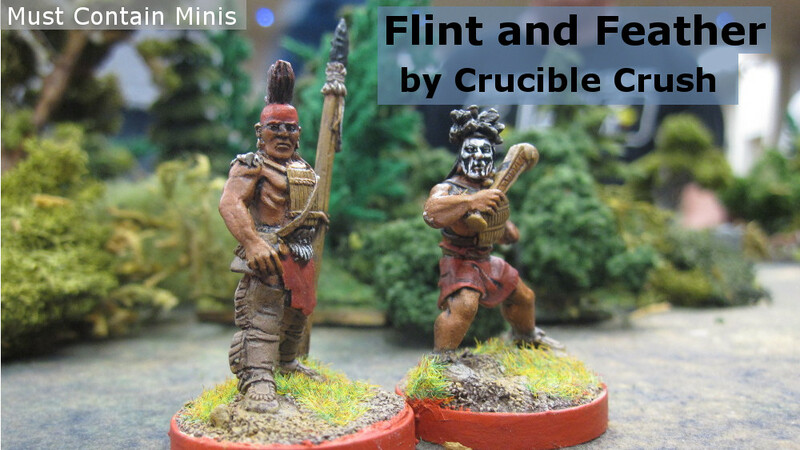 The Title Image from today’s Post on Must Contain Minis – a quick Battle Report of Flint and Feather.